Roth regenerative turbine chemical duty pumps provide continuous, high pressure pumping of non-lubricating and corrosive liquids. 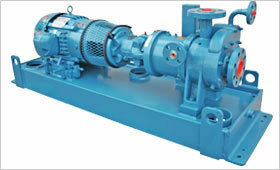 These regenerative turbine pumps are provided with one piece, machined self-centering impellers for operation with a wide variety of chemicals with process heads up to 1400 ft. (427 m.), 600 psi (40 bar), TDH at 3500 rpm, NPSH from 3 to 14 ft. (0.91 to 4.2 m.), and temperatures to 450°F (232°C). A wide variety of mechanical seals are available. Front pull-out makes pump seal maintenance easy. 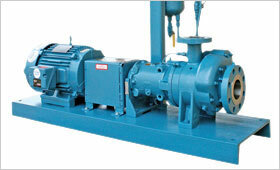 Roth regenerative turbine chemical pumps are providing continuous, reliable service in many types of environments around the world, including offshore oil platforms, refineries, and chemical and industrial plants. Capacity 100 GPM (22.7 m3/hr).